In one sense, Puri is synonymous, with Jagannatha and vice versa. For more than a century past, historians, foreign and Indian, have been trying to’ unveil the mystery of the three deities namely, Jagannatha, Balabhadra and Subhadra worshipped in the Puri temple. But the success they have achieved is almost negligible. All the same, the traditional authorities strongly hold that Jagannatha is perhaps as old as human civilization. The antiquity of Jagannatha is so much shrouded in mystery that it may take many more years for scholars to arrive at any definite conclusion. There are a number old works in Sanskrit which sing the glories of Odisha in general and of Puri in particular. A passage is frequently quoted from the Rig Veda and explained in the light of the well-known commentary of Sayana to show that the history of Jagannatha dates back to the age of the Rig Veda itself. 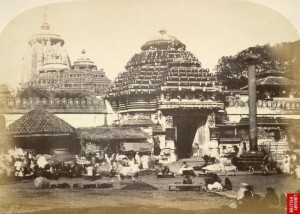 The main temple in Puri is surrounded by about 30 temples, small and big, a listof which may be seen in Chapter 8. They were Put up at different periods of history by different periods. Even to, this day, the pilgrims are generally advised by the Pandas to visit and offer worship in almost all these temples before they are taken to the Jagamohana or the porch to see the presiding deities in the sanctum sanctorum.